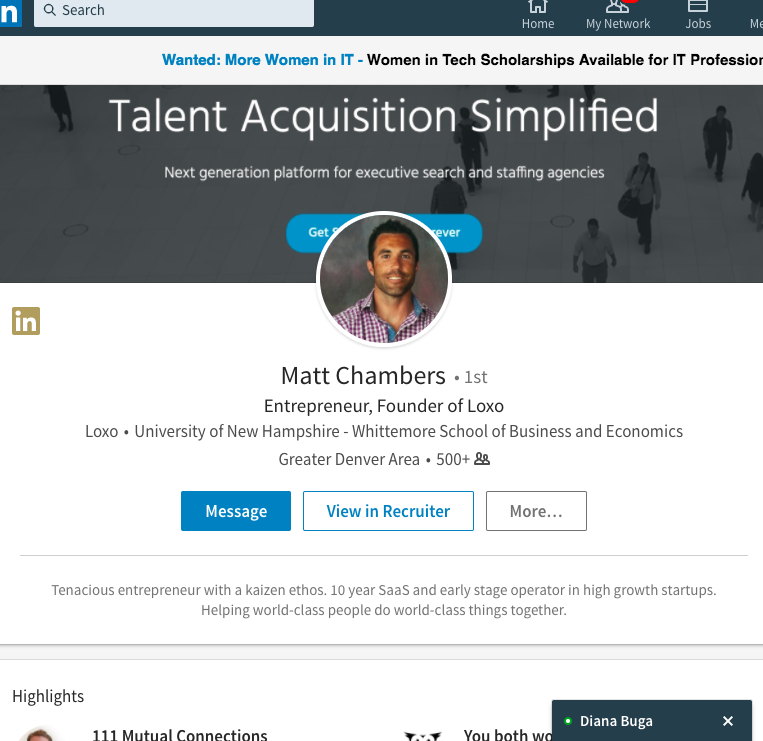 Loxo is packed with features that help you hire top candidates as quickly as possible. We focus on making recruiting simpler so that you can spend your time growing your business. Loxo's sourcing automation tools help you find the best talent faster than your competitors. Yes, really. Quickly add candidates to Loxo from LinkedIn, Indeed, Angelist and GitHub with the click of a button. Ask and you shall receive. Get a list of the best candidates in your market with one click. Sourcing automation is here and it's called Loxo AI™. Post your unique opportunities to multiple job sites and share your job descriptions on social media channels that your candidates are actually using to find new roles. Drag and drop, upload or forward resumes and Loxo will auto parse the data for you. Once you find the best talent for the roles you are trying to fill, Loxo will help you connect with those candidates. Your one-stop-shop to find both personal and professional phone numbers and email addresses. No more searching for that hard-to-find information. Loxo's state-of-the-art search tools allow you to find contacts and candidates that you have already sourced into your Applicant Tracking System (ATS). Click-to-dial your candidates in Loxo, automatically drop pre-recorded voicemails, schedule your calls in the Call Queue, then use our analytics tools to measure your ROI. Keeping up with your candidates and business contacts is easier than ever with our CRM and sales pipeline management tools. Sync your email and calendar with our industry-first two-way sync tool in Loxo. This eliminates data entry for you and helps you manage that growing 'To Do' list. 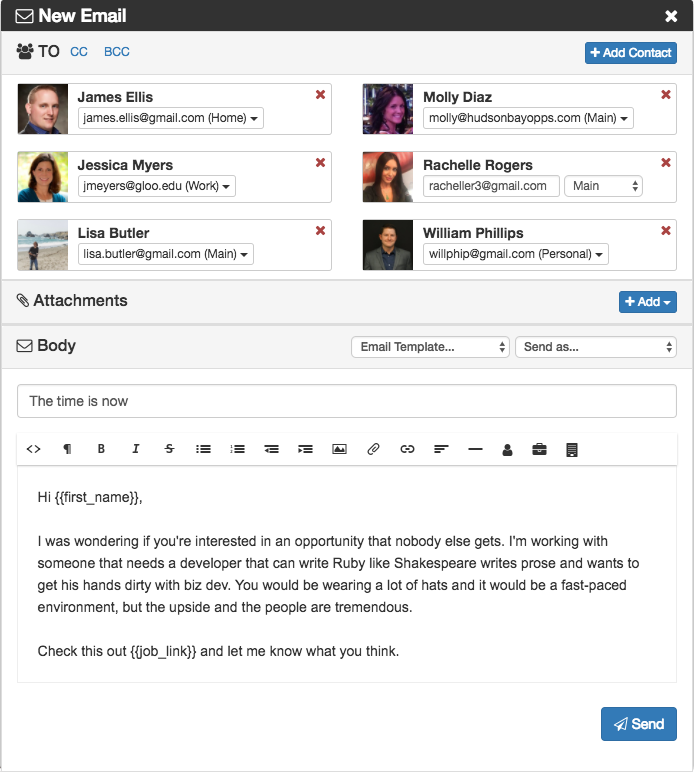 Personalize your emails to every candidate with our bulk email feature. Now you can give your candidates a world-class experience while saving time. On the road? No problem. Take your contacts with you wherever you go with our mobile web app. With our data-driven technology, stay on top of your revenue goals with more insight into your processes. Use our API to share your jobs on your terms. Integrate your Careers page with your Loxo database using your secure credentials. Loxo is not just another ATS or recruiting software platform. By using first-of-their-kind features such as built-in Click-to-Dial, Voicemail Drop, Call Queue, Loxo Connect™ and automated sourcing, Loxo will be your new-found competitive advantage. It really is that simple. Click once to dial your contacts from your Loxo app. If you are leaving voicemails in real-time, you are behind Loxo users that have automated tasks as simple as leaving a personalized voicemail. Manage your daily calling list with Loxo's rolling Call Queue that will help you stay focused, organized and make 10 times more calls than you do now. There's no reason to scour the internet for a top candidate's email anymore. Loxo Connect™ finds personal and professional emails and phone numbers for you. Now you can replace the time you spend sourcing with Loxo AI™. Well send you the top candidates for your job faster than you can source them yourself.